We provide water heater replacement services to those in Barrie, ON and many of the surrounding cities. Water Heater Replacement in Barrie – Water heaters are some of the most highly utilized appliances within residential properties. Not only do we rely on the hot water to bathe and wash our hands, but we also need it for running the washing machine, dishwasher, and meal preparation. Most water heater manufacturers recommend replacing units at least every 10-15 years. You might get some warning signs before your water heater stops working, such as strange odours or sounds coming from the unit. Unfortunately, many homeowners experience leaking water heaters when they give out, which can cause a lot of damage very quickly. If you notice any wet spots on the floor around your water heater, it is important to have it checked out as soon as possible to prevent more serious damage. At Andrew’s Heating & Air Conditioning, we provide water heater replacement services in Barrie, Ontario and many of the surrounding cities. We also offer rental water heaters. 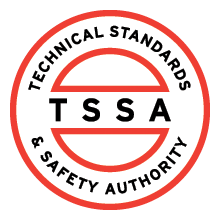 Our technicians receive extensive training, so we can make sure to install a new unit that meets the needs of your household. It is always frustrating when you go to take a shower and the family members before you have used up all the hot water. If this happens on a regular basis, it is probably worth looking into water heater replacement to get a more efficient unit or to upsize to a bigger tank. 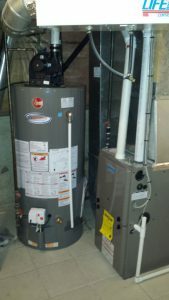 We are happy to help with water heater replacement, repair, and maintenance. Call us today to find out other benefits of replacing your water heater with one that is more efficient and functional for your home. At Andrew’s Heating & Air Conditioning, we offer high-quality water heater replacement services in Barrie, Innisfil, Alliston, Angus, and Midhurst, Ontario.